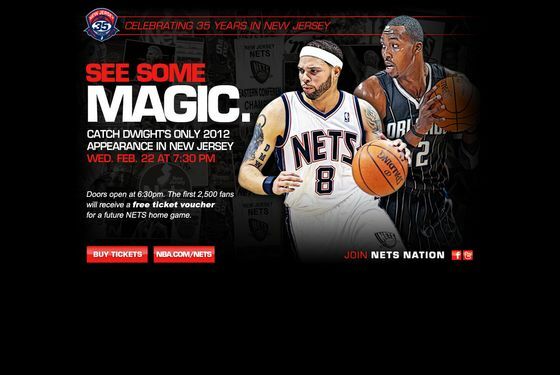 Dwight Howard and the Magic are in Newark to play the Nets tonight, and visitors to the Nets website today are reminded that this is the center's only appearance in New Jersey this year. It's a reasonable enough way to promote the game: Howard's a big star whom fans of any team would come out to see. But tonight isn't just a chance to sell tickets: It's a chance for the Nets to impress Howard, who could become a free agent after the season (or be dealt before the March 15 trade deadline). As Deadspin pointed out last week, the team had discounted tickets in the Prudential Center's Loud and Proud section — in which fans must wear Nets apparel "to show that they are loud and proud" — to $12, and while there's nothing wrong with a promotion like that (especially for a team that ranks 29th in average attendance), one could view this as trying to impress Howard with a large, enthusiastic crowd for his one visit to Newark this season. As Stefan Bondy explains in the News today, "The idea is to provide an atmosphere to impress, unlike a typical Nets game." Speaking of providing an atmosphere to impress: Andy Vazquez, the beat writer for the Record, says the team appeared to be setting up for a special pregame pyrotechnic show. Tweets Vazquez: "What a coincidence." Would Howard really be influenced by the scene in the arena tonight, no matter how spectacular the pyrotechnics? And does any of this even matter, since the atmosphere at Nets games is likely to change anyway once the team moves to Brooklyn? Maybe not. But the Nets don't seem to be taking any chances.